Preheat oven to 180 °C and grease a 12-hole 1/3 cup capacity muffin pan. Sift wholemeal plain fl our, lupin flour and baking powder into a bowl. Return bran husks into the flour. Stir in sugar and blueberries. Stir to combine. Make a well in the centre. Combine buttermilk, eggs, vanilla and oil in a jug. Pour over flour mixture. Add blueberries. Stir until just combined. 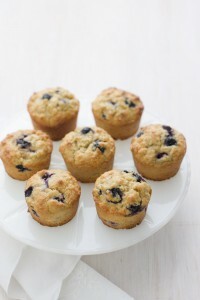 Divide blueberry mixture among muffin pans. Bake for 25 minutes or until golden and cooked through. Stand in the pan for 5 minutes. Turn out onto a wire rack to cool. Serve warm or at room temperature. Note: Lupins may cause an allergic reaction in people with a peanut allergy. Add some ground cinnamon or mixed spice and ¼ cup chopped pistachios.